Simply Pam: Super Fun Birthday Project & Giveaway - Day 3 w/ Julie! Super Fun Birthday Project & Giveaway - Day 3 w/ Julie! Welcome to Day 3 of my Super Fun Birthday Week! Today my guest designer is Julie with Ready Set Stamp. I am also on the My Pink Stamper design team with Julie. Actually she and I were on Robyn's original design team so this is our second time around with each other and I had so much fun working with her. Julie has always been supportive and so kind to me over the years. She was one of my first followers and commenters on my blog. I so appreciate her. Here is her card. I love it! It is so colorful and fun! 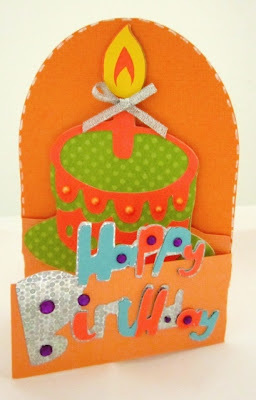 Make sure you head on over to her blog to find out more information on how she made the card as well as see what other projects she has made. She is so talented! To be eligible to win leave one comment on this post with a way to get a hold of you. You don't have to be a follower of my blog to win but I won't kick you out if you are. :) You have until Sunday, July 17th, 6pm MT to leave a comment to be eligible to win. I'll announce all of the winners on Monday, July 18th. Make sure you stop by my blog tomorrow to see a new project by a new guest designer and giveaway! ~ Thanks for stopping by and a BIG THANK YOU TO JULIE! such a beautiful birthday card.... Thank you for sharing your birthday with us Pam.... Thank you for the chance to win some fabulous candy. Love your card .Thank you for a chance to win . That card turned out so cute. Love the colors. What a great card! I kind of forgot that I have that cartridge and could make a card like that! Thanks for the reminder and inspiration! And Happy Birthday again!!! Very sweet card and love the way it opens!! TFS!!! What a bright card. Orange is my favorite color. Love the fun factor of this card...Great desgin. TFS! really cute card!!! Love it!! Love this card! So cute and colorful! I have been looking at this cartridge too. Thanks for the inspiration! Pam, you have such wonderful, creative friends! I love Julie's card!! Very cute card Julie and Happy Birthday Pam! Oh now I see another cartridge I should have! Julie's card is sooo cute! Thanks for the chance to win. I love all the things you are giving away. Nice card love the bright colors. wow love how bright and colorful that card is.. thanks for the chance to win :) (ive been a follower for awhile now). love the shape of this card! Hi Pam, I just became a follower today and already like what I am seeing on your blog. Can't wait to see tomorrow's project. Thanks for the chance to win the blog candy. Beautiful and bright card. Love the design and shape of it. Julie's card is so fun & colorful! very cool design! Great card! It just screams Party! Thanks for giving away all the FABULOUS BLOG CANDY for YOUR birthday! You are awesome! Happy Birthday Pam! Thanks for the chance to win. A bright and cheery card. I love orange! Awesome card! Thanks for sharing your ideas and your talents with us. Julie's Card is sooo Cute! Love the bright and Cheerful Colors. My Sister has this Cartridge. I may have to barrow it. Another fun card to celebrate your birthday week! Love all the bright happy colors. Thanks for the opportunity. Wow... The guest designers have been doing some awesome things this week. Thanks for the chance to win!! Beautiful card! I love the bright fun colors. :) Tfs and have a great day. 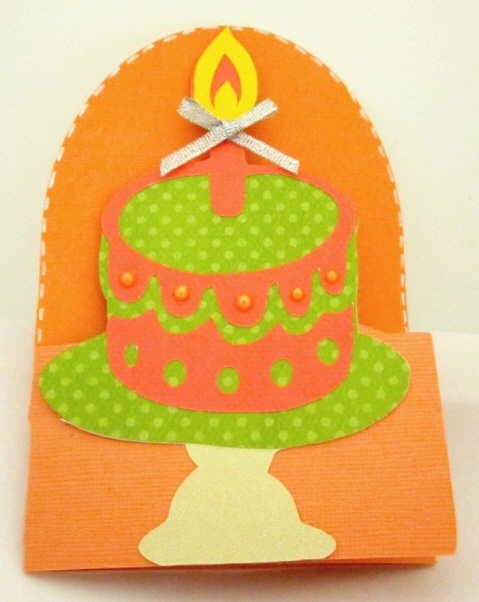 What a fun, bright & cheerful card! Ooo I want that cartridge, that is such a cool card. Great giveaway today, those papers are so cool and of course I love those flowers! I have that cartridge. I have got to try that card! Julie's card is really nice. Take care. Very cute card! It's so bright and cheerful! What a cute card! The colors are perfect for a b-day card. I like the colors on this card and the design. I'm pumped to go make one of these but I will have to get help by the Design Studio. I know, I'm behind the times, lol. Cute!!! Love the colors on this card. Nice giveaway & I am a follower!! Happy Birthday Week, what great fun. You are outdoing yourself with the give-a-ways. Thanks. A very nice giveaway. Thanks for the chance to win...that card is very sweet!--pat n.
Such a nice card! Cool Colors. what a fun card. tfs. What a fun card!! I haven't used that cart for the cards yet, I need to try it because they look great! I am so jealous...two craft rooms! I love the card. It is so colorful and cheerful. Episode 70: What is the Pictionary Word?